Circumpolar, breeding on the Arctic coasts of North America in Canada, Alaska, and Greenland. Eurasia populations are found in Iceland, Norway, and Russia It winters at sea further south, as far as the United Kingdom, South Carolina and Washington in the United States, Korea on the Asian Pacific coast, and other areas including the Black Sea and Caspian Sea. Populations are vulnerable and appear to be declining, but numbers are difficult to census because of offshore wintering areas. 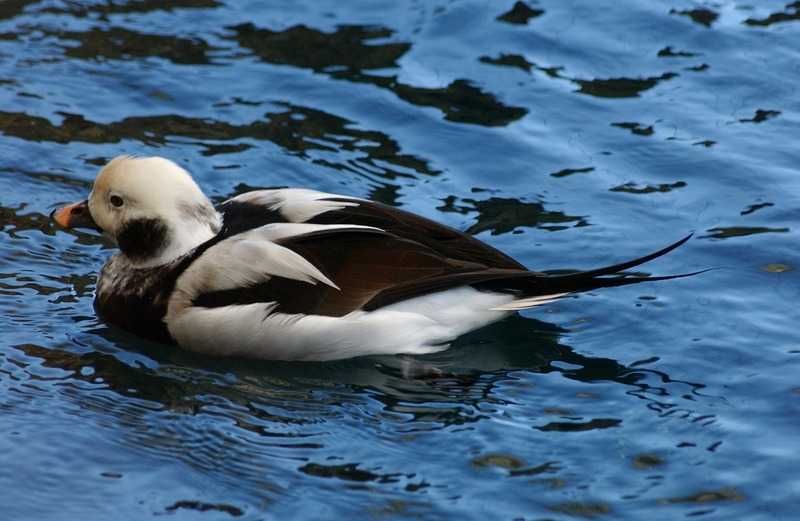 Entanglement in fishing nets killed tens of thousands of Long-tailed Ducks in the 1950s, especially in the Great Lakes. Sexually dimorphic. Four different plumages over the year, in contrast to most sea ducks, which have two. The male has bold black and white plumage, whiter in winter, and more dark in summer, with long, slender central tail feathers. The females are a duller brown color and lack the long tail feathers. Diet in the Wild: Mostly aquatic invertebrates, including insects and crustaceans. Breeds in ponds, streams, and other arctic wetlands. They spend winters on open ocean or large freshwater lakes. One of the deepest diving ducks and can dive as deep as 60 feet to forage. Unlike most ducks which molt twice a year, they have three distinct plumages each year, achieved in a complex series of overlapping partial molts. Their call can be heard on a calm day up to 2 miles across the ocean. Formerly known as Oldsquaw, it is distinctive among ducks in plumage, molt sequence, foraging behaviors, and vocalizations.